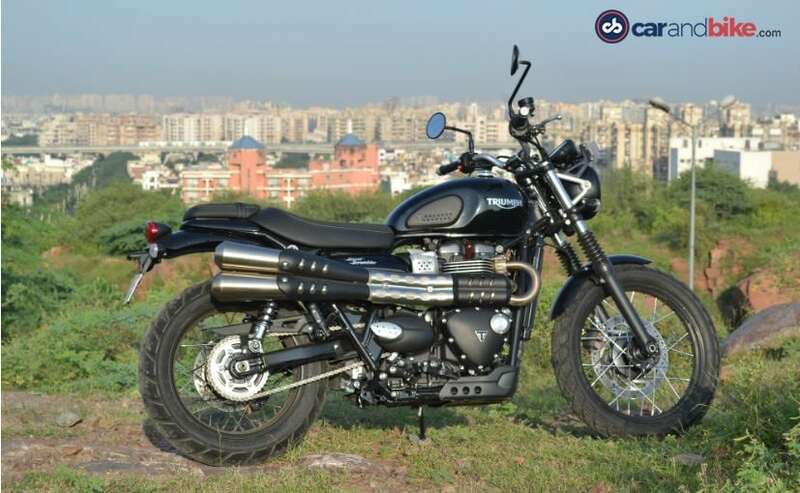 The all-new Triumph Street Scrambler is the latest entrant to the modern classic range of Triumph Motorcycles India. It’s got classic Bonneville styling with ‘scrambler’ credentials. And according to Triumph, the Street Scrambler is more than just a cosmetic upgrade on the Street Twin; this is one bike in Triumph’s range which meets a very niche demand of customers – a motorcycle with classic styling, coupled with adventure capability. Apparently, a large section of modern classic owners (and prospective customers) seek that extra capability from their bikes, and that is the void the Street Scrambler tries to fill. And that’s quite a well thought-out strategy; because more than 40 per cent of Triumph India’s sales are from the modern classic range with bestselling models like the Street Twin and Bonneville T100. 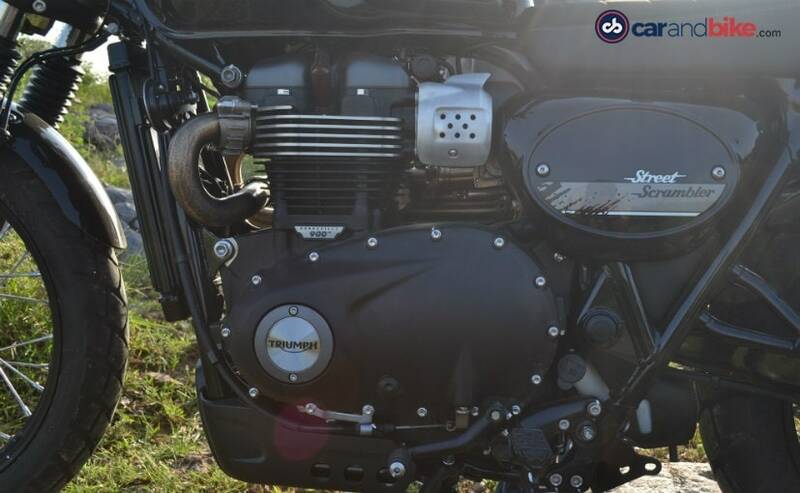 The Street Twin, Bonneville T100 and now the Street Scrambler all share the same 900 cc parallel-twin engine. For most riders looking to buy their first big bike, it is these three models which will be the stepping stone into the world of Triumph Motorcycles. So, a motorcycle boasting of easy ride-ability and decent off-road capability seems like the perfect recipe then. Or is it? Of all the Triumph modern classics, it was always the Bonneville T100 which tugged at the retro-loving corner of my heart. The Street Twin, at least to me, missed that “something special”; it looked too plain, and didn’t quite have the road presence. That’s not to say that the Street Twin is lacking in any way; it’s a great bike, but just didn’t feel ‘special’ to me. At first glance, the new Street Scrambler immediately fills up that ‘something missing’ part; the scrambler-style exhaust is the most conspicuous design element, and the bike sounds bassier and meatier too, but the differences don’t just end there. The Street Scrambler gets an engine bash plate, a larger, 19-inch front wheel, and suspension with more travel. 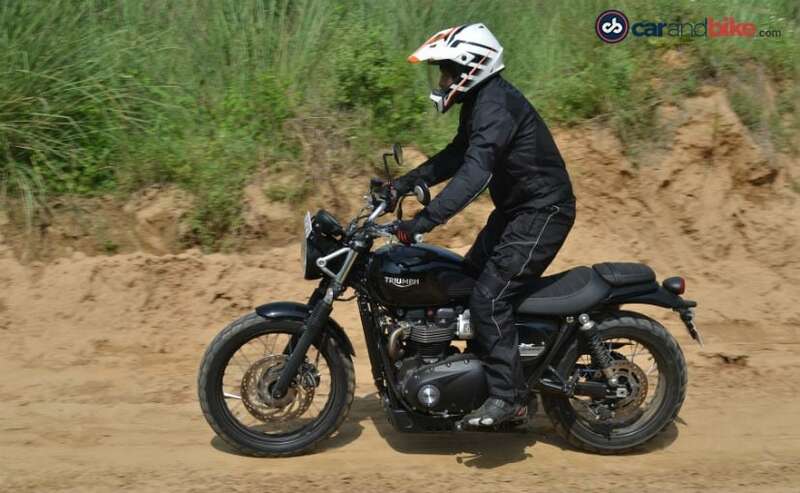 Triumph doesn’t publish ground clearance figures, but the 41 mm Kayaba front forks with 120 mm travel, and a pair of KYB shocks, also with 120 mm travel, coupled with the larger front wheel certainly gives the Street Scrambler decent ground clearance. And the wheels come shod with dual-purpose Metzeler Tourance tyres, for better grip when the going gets tough. Swing a leg over it, and the riding position is noticeably different too, thanks to the wider and taller handlebar, and a slightly taller seat. It’s taller than the Street Twin, yes, but not too tall to become inconvenient for the average rider; so that’s a good thing. The pillion seat can be swapped out with an aluminium rear luggage rack for solo rides, and to carry some luggage. The Street Scrambler’s 900 cc parallel-twin engine is shared with its siblings, but from the get go, it sounds different, and it feels different. The side-mounted, high exhaust lets out a meaty growl, but it’s the state of tune on the engine which makes it feel different. On paper, the specs are more or less the same as the Street Twin and the T100 – 54 bhp of maximum power and 80 Nm of peak torque. 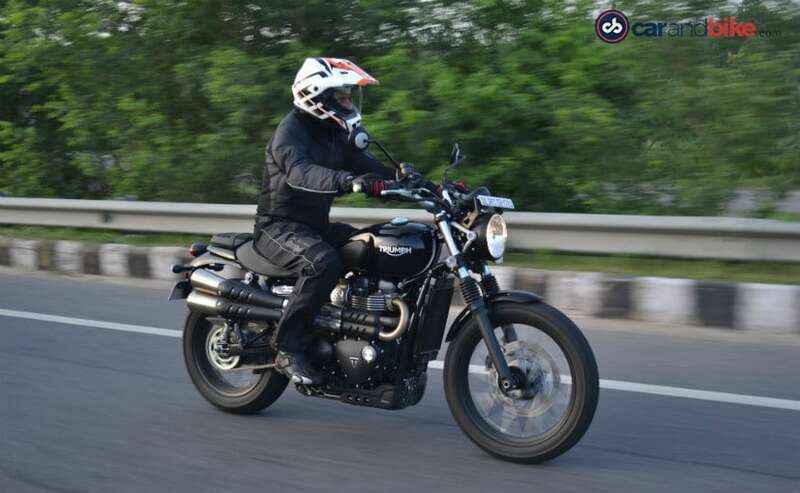 But the torque comes in lower in the revs; what that means is that the Street Scrambler feels a little more eager to pull, with slightly less throttle input. And together with that bassy rumble from the exhaust, the Scrambler’s motor does sound and feel a little punchier. It’s not the neck-slapping over-the-top performer, but it’s got enough juice to keep experienced riders happy, and not intimidate newer riders as well. On tarmac, the Street Scrambler feels like a well-mannered city slicker. The torque-assist clutch has a light feel and the gears slot with precision on the five-speed gearbox. Fifth gear is good enough to pull cleanly from as low as 60 kmph, and a quick downshift or two is enough to get you out through a gap in slow-moving traffic, or when the light turns green. 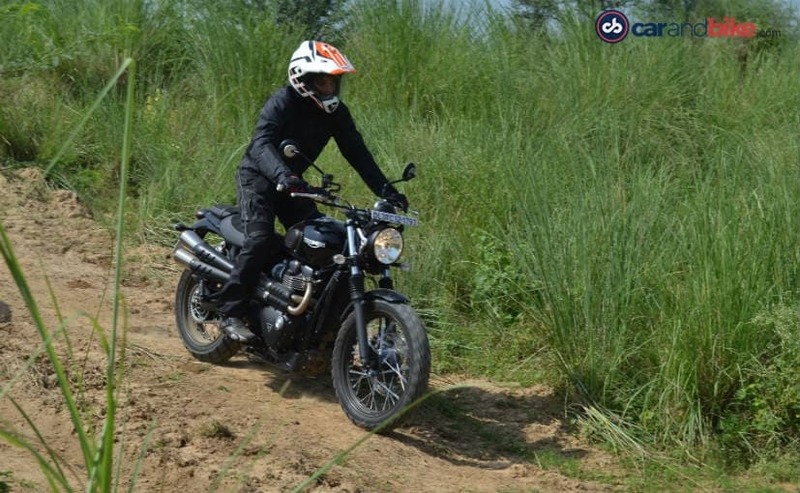 The Scrambler also gets ride-by-wire and switchable traction control and ABS, so there’s a decent safety net for emergency situations. The brakes offer decent bite and progression, and the ABS works like a dream, with sure-shot stopping power. 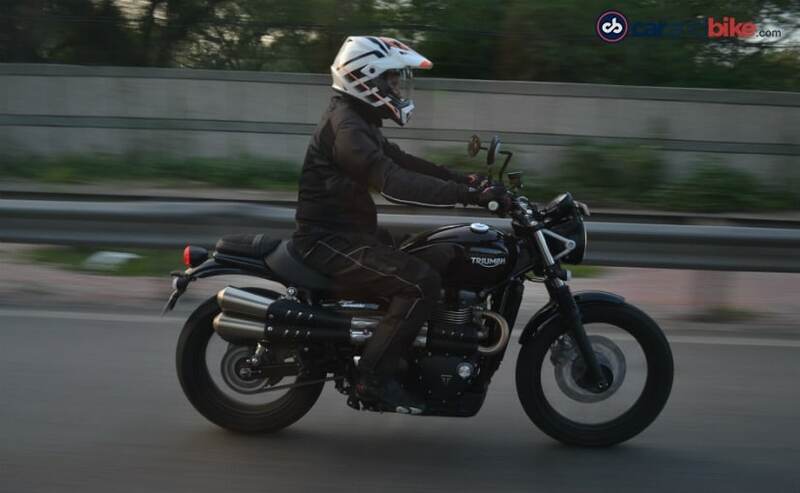 In bumper to bumper traffic though, the Street Scrambler will make you feel the heat, quite literally. The side-mounted exhaust may look cool, but it isn’t the ideal or practical component for the daily commute; even the heat shield fails to stop you from having that warm, toasty feeling on your right leg. But when you leave the traffic behind, and venture out to where the tarmac ends, you forget all that traffic talk and begin to appreciate for what this bike is really capable of. Mind you, this is no dual-sport bike, and it’s no adventure bike either, but it’s got more than enough capability to take on moderate trails and carry out mild off-road duties. The gentlemanly behaviour is forgotten and the hooligan wakes up soon as you switch traction control off, ABS off, and hit a dirt trail. And to top it all, with a dry weight of 206 kg, it doesn’t feel as heavy or as unwieldy as bigger, taller and far heavier adventure bike. 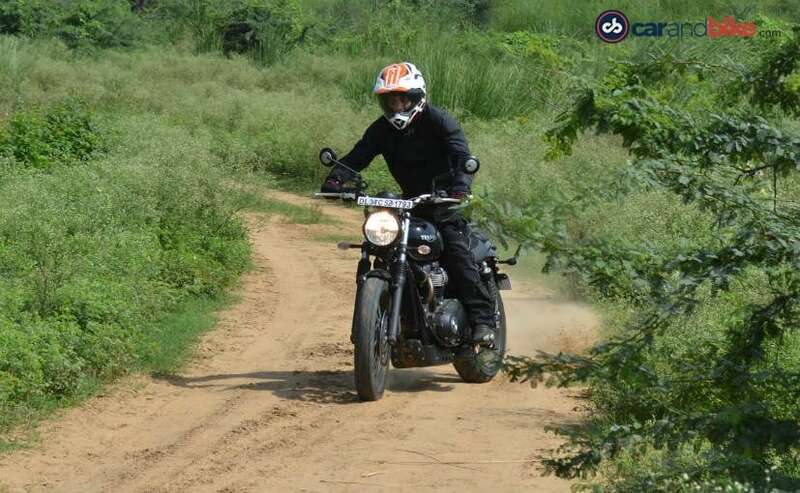 The Metzeler Tourance rubber grips loose surface quite confidently and not once did the suspension bottom out, or the bash plate scrape during our off-road outing. Whatever we threw at the Street Scrambler, it came out tops and impressed us with its off-road prowess. Now, this is a question which has no easy answer. At ₹ 8.1 lakh (ex-showroom), it’s over ₹ 90,000 more expensive than the Street Twin, and ₹ 12,000 more than the Bonneville T100. It also boils down to what you want to do with your bike. Sure, the Street Scrambler has its limitations, and rush hour traffic or the daily commute to work may not be as enjoyable as the Sunday morning breakfast ride with your riding buddies. 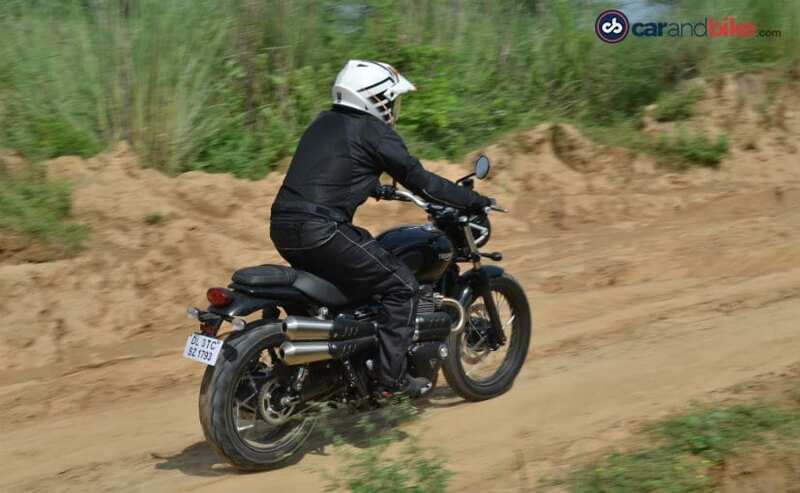 But what the Street Scrambler does bring is actually the best of both worlds – an easy-going street bike, which can take on the occasional long distance ride, and with decent capability to take on the rough. The Triumph Street Scrambler is a fun bike, period. Yes, the Triumph Street Scrambler can be a fun go-around bike at the nearest beach, and even take on high mountain passes across fast-flowing, glacial melt streams and weather beaten roads without so much as a whimper. Eventually though, it’s a motorcycle which can provide you joy, and you can have a lot of fun with it, on tarmac, or off it. 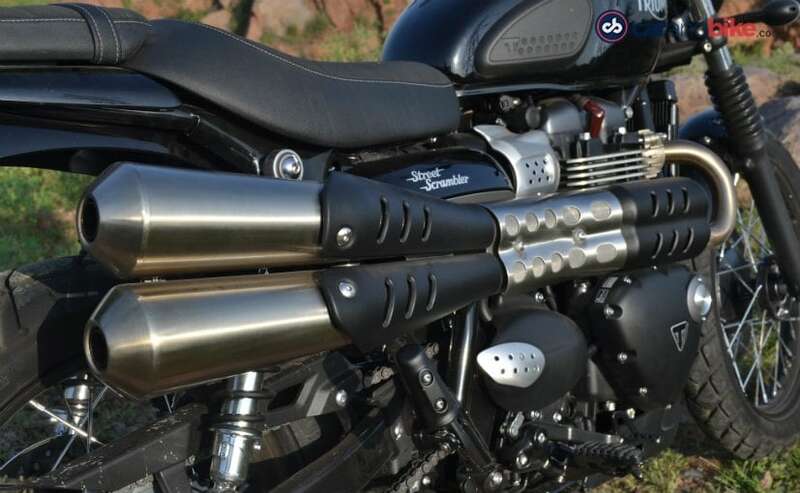 And that’s reason enough to take a closer look at the Triumph Street Scrambler. After all, riding a motorcycle is about having fun, more than anything else. And there’s always the car or a cab, for the commute.